Tis' the season of LOVE! If you're anything like me you love to gift for every holiday and sometimes just randomly! Valentines is another day to show your loved ones just how much you love them. Whether it be by a simple card, chocolate or a gift, I've got you covered! Here are some of my gift guide ideas for her. Doesn't matter if it's your bff, sister, mom, etc. These are all perfect and easy! Chocolates - You can never go wrong with chocolates or some other form of sweets! Whatever their favorite may be, it's always an easy go to. Perfume - If she has a favorite perfume definitely go with that but this particular one I've gotten so many compliments and questions about. It's my favorite scent! Jewelry - These heart shaped earrings are too cute for this time of year! If she's not a heart shaped person then any form of jewelry is perfect in my eyes. Mugs - How precious are these mugs from Target? A definite "aww" response will happen! Slippers - Ok, I've been searching for these babies everywhere and finally found some on Amazon. Cozy anything is always a great gift! Socks - So many people love fun printed socks and this heart pair are perfect for those people! Candle - Come on. Who doesn't love a candle? Pajamas - Cute heart shaped or lips pjs? I'll take some! These silky pairs from VS give me all the heart eyes! Skin products - Any kind of skin product or tool is great for a relaxing night. Welcome to my very own fashion blog! 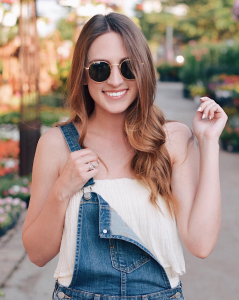 I'm an Oklahoma girl currently living in Dallas with hopes to inspire women one outfit at a time! Subscribe to Randi Lauren and get posts sent straight to your inbox! © Randi Lauren THEME BY: JUSTGOODTHEMES.COM.